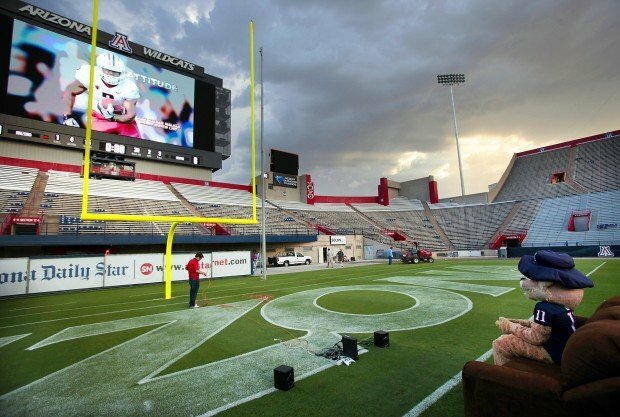 Wilbur T. Wildcat familiarizes himself with the equipment prior to playing a football video game against a UA fan in the first public test run of new $7 million scoreboard at Arizona Stadium. 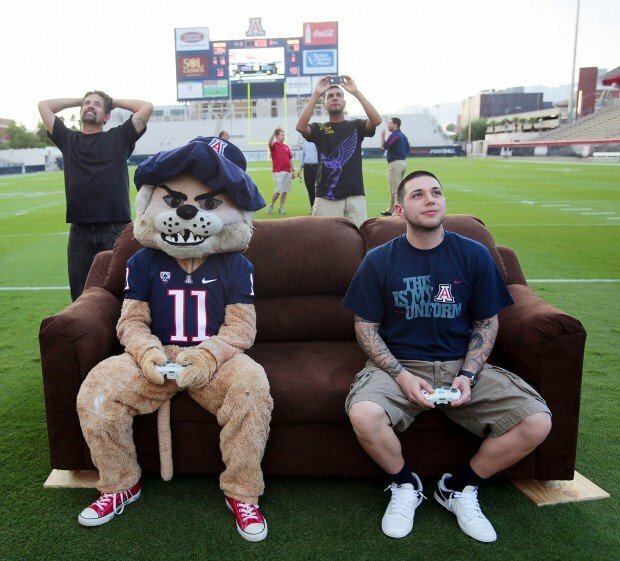 Wilbur T. Wildcat and Nathan Hughes play a football video game while looking up at the new $7 million scoreboard at Arizona Stadium. The UA mascot refused to comment, but gloated after a 46-15 win over Hughes. Minutes after taking Arizona Stadium's new scoreboard for its first public test run Thursday, Nathan Hughes was asked if he could still be a Wildcats fan. After all, the school's mascot, Wilbur T. Wildcat, had just defeated him 46-15 in a game of NCAA Football 12 for Xbox 360. Wilbur ran the score up, throwing deep late and going for two-point conversions. "Yes," he said, joking, "though it's going to be hard. "The board is huge. It looks good. "I'll probably never play on anything this big ever again." The 23-year-old UA superfan and the mascot each won a Twitter contest run by athletic director Greg Byrne to try out the centerpiece of the UA's new $7 million scoreboard project. Hughes and Wilbur - who has four fingers on each paw - sat on a brown couch at the south 2-yard line, and played, at Byrne's suggestion, a game between the UA and his old employer, Mississippi State. Per mascot code, the person inside the wildcat costume didn't want to talk - to Hughes or a reporter - despite being a runaway winner. There was some gloating, though. "He was looking to me," Hughes said, "and giving me the hand signals." The UA has spent one week successfully working out the kinks in time for Saturday's home opener, said Matt George, director of video and information technology. George said the board, at 47 feet tall by 112 feet wide, is the second-largest to be owned by a university's football stadium, behind Texas. Other schools play at stadiums, which they do not own, with larger boards. Byrne called the board - which he can see from his Foothills-area home - "a game-changer." When he added a similar board at Mississippi State in 2008, Byrne said, the energy in the stadium "doubled." The UA will debut a new entrance video Saturday similar to last year's men's basketball films, which featured UA legends. Byrne was coy about details. "If the hair on the back of your neck doesn't stand straight up," he said, "I don't think you have a pulse." UA's Wilbur the Wildcat and UA fan Nathan Hughes battle each other in Madden 2012 football on the new scoreboard at UA Stadium.